Last weekend, I thought that summer was just around the corner. The bright sunshine was making me happy. The temperatures were rising. Everyone seemed ready to ditch the gloominess of winter and embrace the new beginnings of spring and summer. What did I do? I started getting all my warm weather gear ready. For our family, warmer weather means more time outside. From playing in the backyard to many hours spent at the pool, we say good-bye to the coach in the upcoming months. Since I'm away from home often, I need to pack snacks and goodies for the kids. I need a cute, easy to use cooler. Personally, I don't want my cooler to look like a big box. Yes, those type of coolers are great, but I want to look good carrying all our stuff around. My cooler this summer is the Floral Shopper Tote from Igloo. First, the colors are adorable. Just looking at the bright blues and bold flowers brings a smile to my face. More importantly, the shopper's tote doesn't scream that I'm carrying around a cooler. It looks like a canvas purse. When I'm heading to the pool with my bag of goodies, everyone thinks that I have a regular bag (not that I'm sneaking in a bunch of snacks). The Shopper Tote fits up to 30 cans. I don't know if I could carry 30 cans (I'm a little weak on the muscle department), but I can carry tons of water, snacks and treats for me and the kids. I really like the front zipper where I can store my phone, keys or even some sunblock. Another great use for this bag is groceries. Since the Shopper Tote folds flat, I can store an extra one in my car for shopping. Now when I'm at the warehouse store buying tons of freezer pops, I don't have to worry about them turning into a big liquid mess on the car ride home. 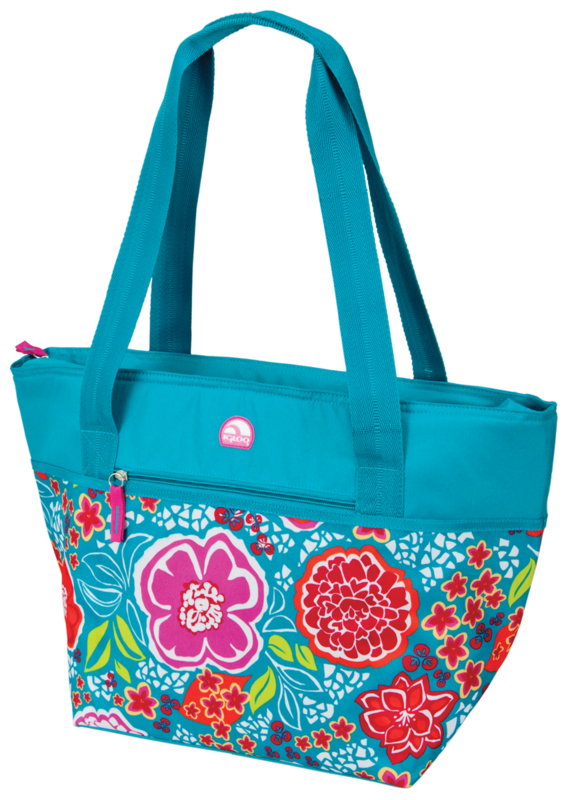 The Igloo Shopper Tote comes in a variety of sizes and colors. The largest size is the 30 can version. Other sizes include 6 and 16. There are several patterns and colors, including classic styles and fun, bold colors. The Shopper totes retail between $9.99 and $17.99. Time to think about warm, sunny weather. Get ready for summer and grab a new Igloo Shopper Tote today!